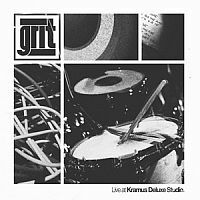 Feasting freely on several decades' worth of tones, the Parisian four piece Grit release their latest EP "Live at the Kramus Deluxe Studio". Is a short statement, but enjoyable nevertheless. There's some good stuff on here. "G.F.Y" and "Ready or Not" are strong modern sounding rock songs. Both show off the band's cutting edge: a raw, unrefined aggression channelled through heavy, rumbling riffage, fixed on an almost nihilistic sounding undertray that comes with some tasteful industrial affiliations. Grit also do well in capturing that genuine rock n roll swagger, so often ignored these days. But most importantly they carry the kicks; the closing number, "Sister", is infectious and has a riff so bottom-heavy that you're bound to reconnect with those hemorrhoids you've been neglecting for so long.